When these oil "experts" speak, we now hit the mute button. T. Boone Pickens. Image source: U.S. Naval War College via Flickr. If there is one lesson to be learned during a downturn, it's that sometimes the experts don't have all the right answers. They certainly have answers and predictions, but few have turned out to be the correct ones. This has burned many an investor who listened to their prognostications. So today, our energy specialists are calling a few of them out on the carpet for their bad predictions during the earlier days of the downturn. Three experts in particular stand out as making really atrocious calls on either oil prices or the general oil market outlook. Because of this, we're now determined to tune them out when they speak up as experts on the oil market. Tyler Crowe: I'm not going to point out one person in particular, because there are simply too many guilty of this. The more and more I listen to energy industry experts and executives within the business, the more and more I find there is a litmus test as to whether someone is worth listening to or not. It's actually a pretty easy test that all of us can do. If said person makes a claim that they see oil prices being at some level in the future... stop listening. So far this year alone, predictions for oil prices have ranged from the "doomsday" scenarios for $20 a barrel to some Pollyanna industry vets thinking the price of oil will rebound to more than $80 a barrel. What's even more surprising about these predictions is that both of these scenarios are supposedly going to happen by the end of the year, based on the same data. This is the fallacy when it comes to predicting oil prices. There are hundreds and hundreds of factors occurring simultaneously all over the world that can impact the price of oil. All it takes is cherry-picking a half-dozen of these data points to make your argument that oil prices will go in one direction or the other. 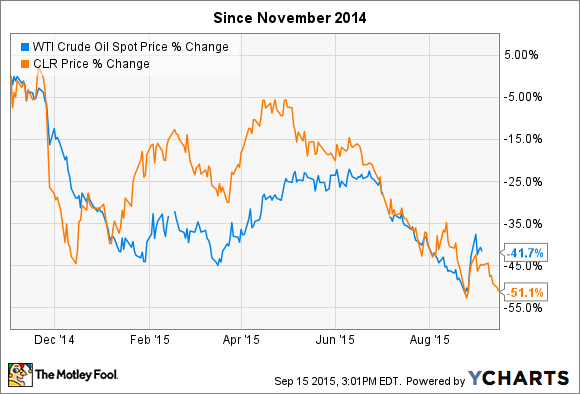 Want to say oil prices will decline? Mention inventory levels in the U.S., slowing Chinese growth, and the possibility of Iran adding more to the mix. How about an argument for an impending price spike? Look at all the debt-burdened companies that could go belly-up, declining U.S. production, or underinvestment in future sources. It's really that simple. We have seen our fair share of oil price prognosticators come and go over the past year or so, and none of them have been more accurate than a simple coin flip. So, rather than listening to the people who say oil prices are going in some direction, pay attention to the ones who focus on the things that need to be done to make a company successful today. The company has also taken on about $1 billion in new debt since then, and its current debt load is pushing $7 billion. Don't get me wrong -- I'm not saying that the stock price would have held up much better in the short term if the hedges were kept in place, but Hamm's decision -- and rest assured, it was Hamm's call, as he controls almost 70% of the company's shares -- materially harmed the company by leading it to take lower prices than it could have captured under the hedges that were in place. Harold Hamm. Image source: David Shankbone via Flickr. On the operational side of things, Continental has done relatively well at driving production costs down, but the reality is, it's very hard to put faith in someone running an exploration and production company -- by far the most exposed segment of the oil business to oil prices -- who's willing to take such a risky bet, versus protecting against the worst case, which is what we've seen so far. Hamm himself has lost billions at least in part because of this risky move, but he won't miss that money. The thousands of other Continental shareholders whom he's harmed in the short term, however, may feel the impact of Hamm's ham-fisted actions for years to come. Matt DiLallo: Harold Hamm was also near the top of my list of energy gurus that I've tuned out, but Jason beat me to the punch on that one. No worries; he's not the only one I'm now tuning out. In fact, since Tyler passed on naming one, I'll name two: T. Boone Pickens and John Fredriksen. In December of last year, Pickens went on CNBC and said that oil would be back in the $90-to-$100 range in 12 to 18 months. We're about halfway into that time frame, and oil is half that price. Undaunted, earlier this year, he simply downgraded that forecast a bit, suggesting oil would top $70 by year end. Maybe it does, maybe it doesn't, but as Tyler put it, it's really a coin flip. While Boone has lost my ear for bold oil price predictions, I will give him some credit, as he seems to have been right about the rig count being important to finding a bottom in oil. However, while that was very useful information, it's hard to listen to a guy who continues to make bold oil price predictions that don't come to pass. As bad as Pickens is at calling a future oil price, few are worse at predicting their own industry than John Fredriksen. For those who don't know, he's the chairman and a large shareholder of Seadrill (NYSE:SDRL). I used to think his company's commentary on the offshore drilling market was a must-read each quarter. However, I have painfully discovered that the company is awful at forecasting the offshore market. For example, in Seadrill's market commentary last September, the company suggested the market was eerily similar to the one it saw in 2002-2003, when oil company cash flows were limited, which led to oil prices skyrocketing. This time, the opposite occurred, as prices have since plunged. Then there's Seadrill's dividend, which the company said late last year was "sustainable until at least the end of 2015"; the company's board (led by Fredriksen) also felt "increasingly comfortable that this period can be extended well into 2016 without any significant recovery in the market." Then, just 90 days later, Seadrill suspended the payout, noting that, "In light of the changes that have taken place since our last report," it had decided the best course of action was to suspend the dividend. For a company to not even have 90-day visibility really calls into question Fredriksen's and Seadrill's ability to forecast anything. I've been burned by listening to both men, as their outlooks helped frame some of my investment decisions. Suffice it to say, I'm no longer listening to what either is saying.